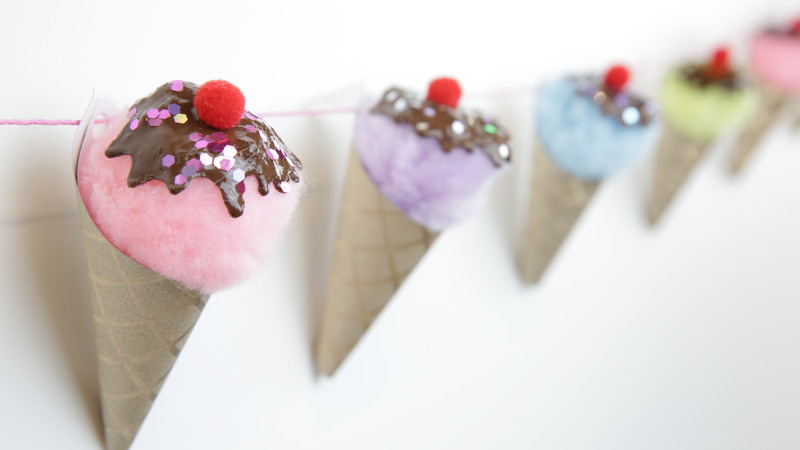 This sweet and cool ice cream garland will be a sundae delight in any room. It’s the perfect décor to sprinkle across your wall, bringing a charming (and flavorful) touch. If you love ice cream as much as we do, then you’re guaranteed to love this DIY. Here’s the scoop! This DIY is made from just pom-poms and a piece of construction paper to act as the cone. The chocolate is just craft paint and the sprinkles are created from our favorite craft material — glitter, of course — adding the sweet finishing touch. They almost look good enough to eat. Watch the video below and you’ll see why we are screaming for this DIY ice cream garland. 1. Paint the tops of the large pom-poms in a dripping hot fudge pattern. Sprinkle with glitter, and top with a small red pom-pom. Let dry overnight. 2. Cut out a long rectangle and curl it into a cone shape, testing out the size with the large pom-poms. Once you’ve established the cone size, cut more rectangles out, curl them into cones, and secure with tape. Hole punch the top of the cone. 3. Hot glue the large pom-poms to the cones. 4. String up the ice cream cones.